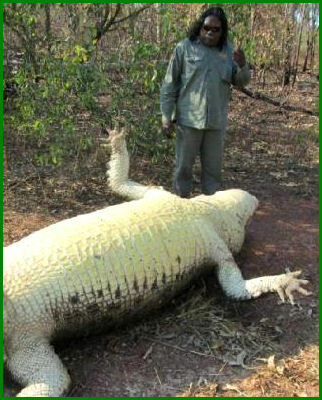 A MUCH-LOVED giant crocodile has been killed - shot between the eyes at close range in Arnhem Land. The 5.1m "boss croc" - known as the Black Crocodile - was "of high cultural importance", elder Goldie Blyth said. Its home for at least 40 years was in and around the Murrkan, Murgenella and Wark billabongs on the Coburg Peninsula north-east of Darwin. Ms Blyth said "this latest victim of new-age technology, avarice and intolerance" appears to have been "murdered" from the Murgenella Creek Crossing last Sunday. The croc was found floating two days later. Jonathan Nadji with the dead croc. "He (once) came up with a large barramundi, he threw the large fish around in his mouth as if to say, 'I got this barramundi' - waving it to us and showing us his catch; he then ate it front of us. It was a very special moment," Ms Blyth said. 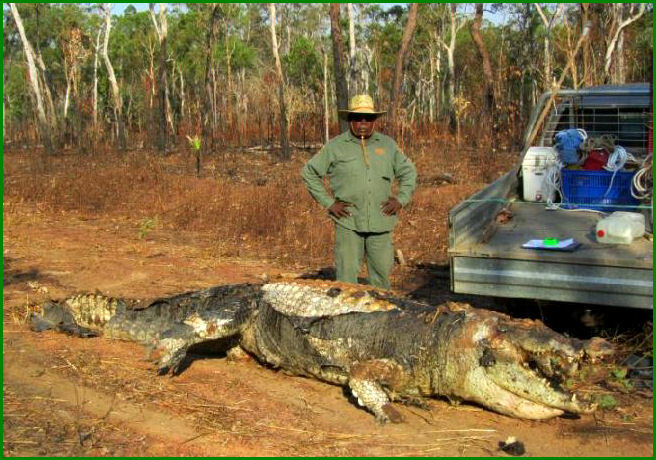 "The crocodile's death is a very sad and a significant loss to traditional owners and the wider community. "Cultural respects were paid on each visit to the site and the resident boss crocodile would seem to respond in kind, by showing itself and then swimming off to tend to its business. Traditional owners would regularly talk to the large crocodile. "People had an enormous respect for the animal and the relationship goes back well over 40 years. "On some occasions, people would talk to the crocodile before fishing or entering the water to hunt file snakes." Ms Blyth called for signs to prevent stopping at the creek by "hoon shooting individuals". She has also called for Parks and Wildlife rangers to be reinstated at Murgenella - and wants the the culprit prosecuted. Ms Blyth last visited the croc about three weeks ago. "In recent times, the Black Crocodile did not like the sound of quad bikes and appeared to be agitated when he heard their sound," she said. "The crocodile was well-known to the old people and his killing is a loss of an important link to past generations that have passed on. "The crocodile was always present or in close proximity to the crossing and was well known to both locals and some visitors."